Many patients with gastric cancer relapse during or early after adjuvant chemotherapy. The standard treatment for early relapse patients is a second-line chemotherapy (SLC) based on irinotecan, taxanes, or a platinum-based chemotherapy. The platinum-containing biweekly irinotecan plus cisplatin (IRI/CDDP) combination was assumed to be promising in several reports of clinical trials as SLC. TRICS trial, a randomized phase III study of IRI/CDDP vs. IRI in platinum-naïve gastric cancers refractory to S-1 monotherapy, revealed that both irinotecan-based chemotherapies were effective and well tolerated. This study analyzed 108 patients in the TRICS trial who experienced early relapse. 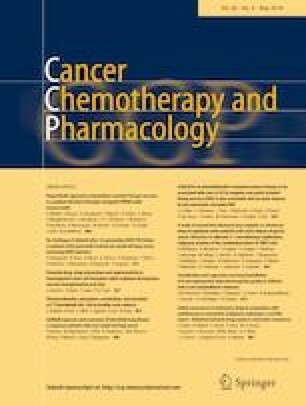 Patients receiving IRI/CDDP (IRI, 60 mg/m2; CDDP, 30 mg/m2, q2w) versus IRI (150 mg/m2, q2w) were compared regarding overall survival (OS), progression-free survival (PFS), overall response rate (ORR), and safety. The OS was 14.0 (95% confidence interval [CI]: 11.0–21.2) and 14.0 (95% CI: 10.7–16.5) months for IRI/CDDP and IRI, respectively (hazard ratio [HR]: 0.782; 95% CI: 0.515–1.188, P = 0.249). No significant differences were observed for PFS (5.0 vs. 4.5 months, respectively; HR: 0.802; 95% CI: 0.543–1.185, P = 0.268) or ORR (19.6% [95% CI: 9.4–33.9%] vs. 23.3% [95% CI: 11.8–38.6%], respectively). The incidence of grade 3–4 anemia was higher for IRI/CDDP than for IRI (20% vs. 0%, respectively; P = 0.0006). Our study showed no significant survival differences between IRI/CDDP and IRI in platinum-naïve patients who relapsed during or within 6 months after S-1 adjuvant therapy; therefore, IRI may be a good option in this population. We thank the investigators who enrolled patients in this trial. Furthermore, we deeply appreciate all patients who participated in the trial. This work was supported in part by the non-profit organization Epidemiological & Clinical Research Information Network (ECRIN). This work was supported, in part, by the non-profit organization Epidemiological & Clinical Research Information Network (ECRIN). [No grant numbers apply]. Kazuhiro Nishikawa has received honoraria from Chugai, Taiho, Yakult, Eli Lilly, Tsumura, and EA Pharma, and research funding from Yakult and Taiho, outside the submitted work. Takaki Yoshikawa has received lecture fees from Chugai, Taiho, Yakult, Eli Lilly and Ono, and for advisory work for Ono and MSD, outside the submitted work. Masato Nakamura has received honoraria from Chugai, Taiho, Merk, Takeda, Yakult, Eli Lilly, Bayer, Ono, and Otsuka Pharma, outside the submitted work. Satoshi Morita has received honoraria from Chugai and Taiho, outside the submitted work. Junichi Sakamoto has received consultant fee from Takeda, and Honoraria from Tsumura, Nihon Kayaku, and Chugai, outside the submitted work. All remaining authors have declared no conflicts of interest to declare.